Is that wisp of an image or thought that flits through our minds a memory or a fantasy? What if there is no image or thought at all when someone tells us something terrible may have happened to us many years ago? Is there a way to know for sure? And how might this maybe experience we do not remember have affected our lives? How do we respond to the possibility in the present? In Amy Herzog’s 2012 play, “The Great God Pan,” now at Jewish Repertory Theatre, the answer to the last question is, not very well. In ten short scenes in under an hour and a half, we learn that 32-year-old Jamie (Adam Yellen), a journalist, may or may not have been molested by the father of his boyhood friend, Frank (Jordan Louis Fischer) when he was five. Then Jamie, his partner Paige (Kelly Beuth), and his parents, Cathy (Lisa Vitrano) and Doug (Steve Vaughan), experience the repercussions of that possibility. Jamie has no memory of being molested, but is very affected by Frank’s revelation. He begins investigating his childhood, first going to his mother, then to Polly (Darleen Pickering Hummert), the elderly woman who was his and Frank’s babysitter, trying to find out what they might know that he does not. At the same time, he and Paige are in turmoil over her unexpected pregnancy. As Jamie agonizes over whether he was molested, he and Paige grow further apart. In their arguments, which have an element of violence, they both become their worst selves, using each other’s weaknesses as clubs while they struggle with their own demons. The play is not all angst. There are moments of humor and genuine love and caring between the characters, as when Doug comes to Jamie's house to talk with him about past events. In their scene, Jamie and Polly recount things that happened in his childhood. 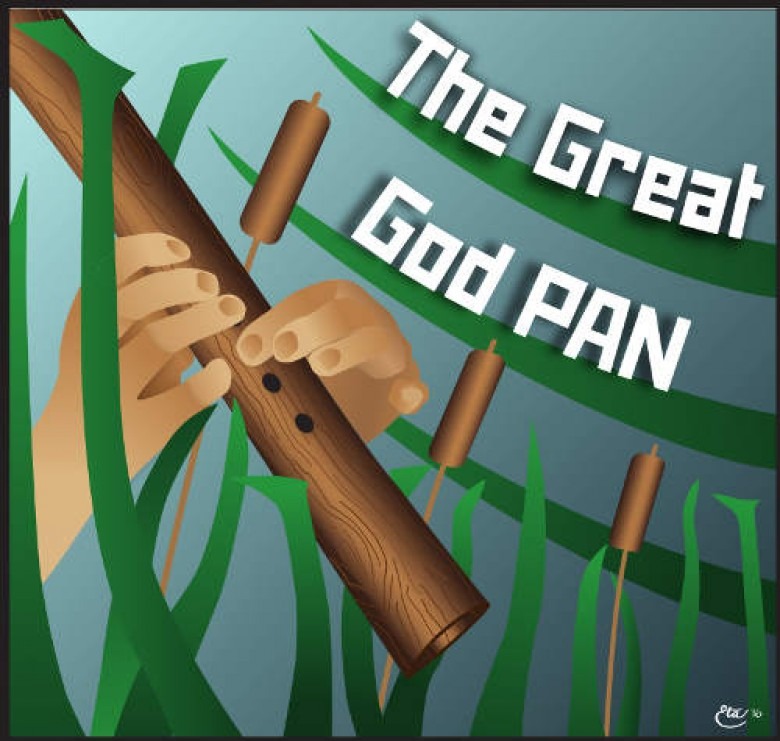 She would recite Elizabeth Barrett Browning’s poem, “The Great God Pan” to the boys when they were down by the creek. And in two scenes that seem like they are in a play of their own, Amelia Scinta as Joelle is a rather farcical, anorexic patient of Paige's. As one scene follows another, we learn a little bit more about the lives of the characters. In fact, we learn a great deal about them in this short play, which speaks to Ms. Herzog’s ability to develop her characters and her use of dialogue to expose them. Mr. Fischer’s Frank is charming in his awkwardness when he talks about being molested, and then tells Jamie the same might have happened to him. He is compassionate and courageous in telling his own history, and while listening to Jamie as he struggles. Adam Yellen as Jamie was troubled even before the events that take place in the present. He is dogged in his investigation of his past, so much so that his determination frightens Polly when he visits her in the nursing home. In his confrontations with Paige, we can feel the rage and fear seething underneath his attempts to remain calm, and the explosiveness when his rage bursts forth. This is a man at odds with himself, with who he is and who he thinks he is. Kelly Beuth is expressive in her anger, hurt, and disappointment with Jamie's distance and being emotionally unavailable, so much so that one wonders what has kept her involved with him for six years. She is a very unhappy and discontented woman. Steve Vaughan is an unlikely "yoga guy,” and his love for his son and worry that his own past behavior is the catalyst for Jamie’s unhappiness are very heartfelt. Lisa Vitrano as Cathy is funny in her attempts to act the warm cuddly mom while she clearly is lacking that gene. Her oblique criticisms of Jamie hit home with him. At the same time, her love for him is also clear and real. They are refreshing and first-rate in their roles. Ms. Hummert as Polly, who is confined to a wheelchair, is convincing as an elderly woman suffering from dementia, while at times she seems a bit fussy in her gesturing. Ms. Scinta rounds out the cast as the anorexic Joelle. One does not usually think of a person with an eating disorder as being particularly amusing, but this one is, while obviously suffering, as well. The sure-handed direction is by Saul Elkin. Set is by David Dwyer. Costumes are by Kari Drozd, lighting by Emma Schimminger, and sound by Tom Makar. The use of four separate staged areas in this black box theater denote a park, an office and two homes. This allows for quick scene changes, always a plus. This is not a play with a clear ending. In its ambiguity, it presents a segment in the lives of people to whom something unexpected and unwelcome occurred. We watch as they try to cope with this new information, but have not yet come to terms with it.